The Coming of Christ was commissioned for performance at Canterbury Cathedral in 1928, as a modern Mystery Play. With words by John Masefield and music by Gustav Holst, it was a great success at the time – but has rarely been performed since. This recording, uses an abridged version of the original script, recited by Robert Hardy. 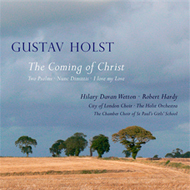 The recording also includes some smaller choral works by Holst that are long-standing favourites in the choir’s repertoire. For further details, please visit the website of EM Records.